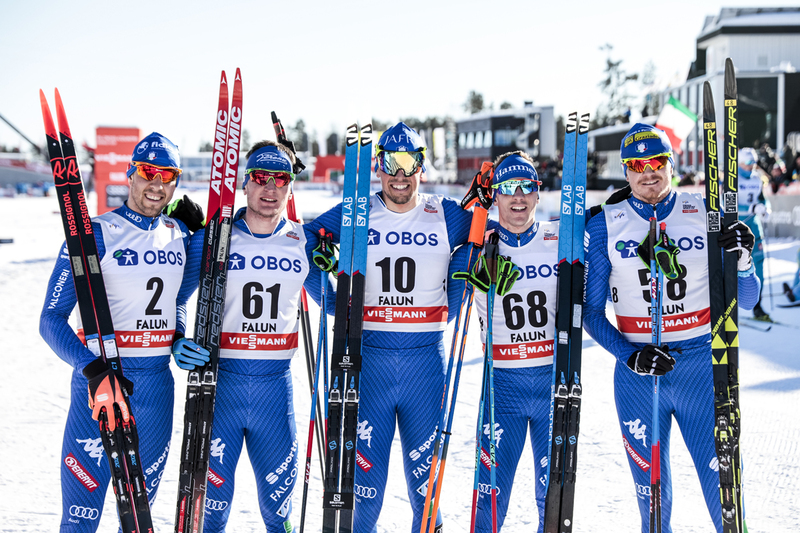 Welcome to FasterSkier’s World Cup Preview, where we check in with the top-10 teams from last year’s FIS Cross Country World Cup tour before the season starts with the Ruka weekend in Kuusamo, Finland, on Nov. 24 with a classic sprint. One name to rule them all in Italy: Twenty-eight-year-old Federico Pellegrino. Synonymous with fast and furious when it comes to freestyle sprints. Last season Pellegrino won World Cup sprints in Dresden and Lahti, both were skate. He stood second on World Cup skate sprint podiums on three other occasions in 2017/2018. One of those seconds was in Seefeld, Austria – site of the 2019 Nordic Ski World Championships. And yes, it’s a skate sprint this season in Seefeld. For the naysayers out there, claiming Pellegrino is a one-trick-pony, the skate specialist claimed a 2018 Olympic silver medal in the classic sprint. The 2016 winner of the overall FIS Sprint Crystal Globe, Pellegrino has been out-hustled by Norway’s Johannes Høsflot Klæbo for the sprint cup since. With nine of the 12 World Cup sprints this season designated skate technique, it may be time for the Italian flyer to claim sprint cup number two. Dietmar Nöckler returns as a possible Pellegrino partner in the team sprint. The duo placed first in Dresden’s skate team sprint in January. The big-stage team sprint in Seefeld is classic technique. Francesco DeFabiana provided the Italian men some 15-kilometer punch in 2017/2018. DeFabiana placed third twice on the World Cup last year: in the Oberstdorf’s 15 k skate and Falun’s 15 k classic — both were mass starts. Thirty-four-year-old Elisa Brocard stepped up for the Italian women. She was a steady top-30 skier, including several top-20 results. Brocard was Tour de Ski ready, placing 17th overall. By season’s end, she ranked 29th in the distance cup – her highest position since beginning her World Cup career in 2008. On the sprint side for Italy’s women, Greta Laurent placed consistently in the top-30. Her best result, a ninth place, came in Seefeld’s skate sprint. Laurent finished 2018 ranked the 36th sprinter on the World Cup. On a lighter Note: the Italians raced in sporty royal blue suits last season. It didn’t take long for a rebrand. Kermit the Frog may have spoiled it for Italy when he bellowed, “It’s not easy being green”. Despite that lyrical foreboding from the iconic amphibian, you will not miss Italy this season on the race tracks. Think green.